The ABI GeneAmp 9700 PCR System brings you high throughput thermal cycling in a flexible package. This PCR system uses interchangeable well blocks for a modular solution and has exceptional heating and cooling uniformity for high quality results. This compact thermocycler comes with a dual 96 well silver block. The ABI GeneAmp PCR System 9700 Thermal cycler is easy to use, and guides users through a graphical display. The microprocessor control of this PCR can store up to 120 user defined protocols. Set up of this thermal cycler is fast and easy thanks to comprehensive programing features and display in realtime. 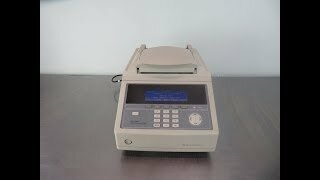 In addition to protocols, this thermal cycler has a variety of diagnostic tools, validation tools and backup systems, with a history that can be audited including time and date stamps. This ABI GeneAmp PCR System 9700 has been thoroughly inspected and is performing to factory specifications. All of our lab equipment comes backed with our standard warranty. Should you have any questions, please don't hesitate to contact us.